Sega Looking at Sonic Boom Trading Cards & Archie Comic adaptation? Following the Vegas Licensing Expo, Sega have held an interview with License! Global magazine in which they go into detail about Sonic Boom including a few new details regarding their plans with the Boom franchise. From what was said, it sounds like the plans for Boom run much deeper than the initially announced game, toyline and tv-show adaptation. According to the interview Sega intends to license out boom along the following categories. 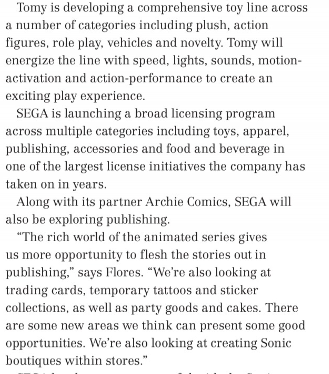 In addition to this, Sega are also looking to work with Archie Comics to ‘explore publishing’ which would suggest a comic book adaptation. Other details from the interview were suggestions that Knuckles is now comic relief, that Sonic has been split into a two tier franchise, with Boom being aimed at younger audiences, but a retro/classic look and style for older fans. It sounds a lot like Sega really are putting everything into Boom, what do you think, excited for the plans or think it’s a bad idea? That’s why we have the comments. Source: License! Global June issue.